I hope you have all recovered from your turkey-stuffing-and-pie-induced coma of yesterday! 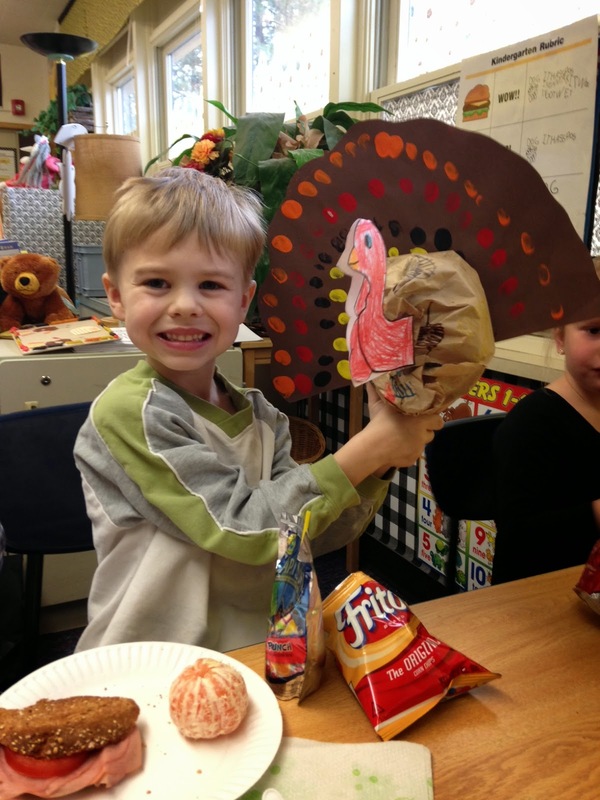 We had a wonderful Thanksgiving, from the kindergarten feast with Evan's class on Tuesday, to the family-and-friends feast yesterday. Now it's time to look ahead...only 26 days until Christmas!!! I'm one of those who never thinks about Christmas until after Thanksgiving, so I'd better get busy! First thing's first...where's my Christmas music?? Lately we've been trying to focus our Christmas gift-giving, especially to our kids, less on "stuff" and more on experiences. In past years we've given tickets to concerts or events, art supplies, a month of some kind of lessons. We've also stuck a gift card for kiva.org in their stockings each of the last two years. Basically, you scroll through hundreds of profiles - a chicken farmer in Uganda, a taxi driver in Uzbekistan, a seamstress in Bolivia, a shop owner in Cambodia - and select one to lend your $25 to. Of course, behind the scenes, it's a little more complicated than that. Kiva partners with microfinance institutions all over the world who do the actual lending and our $25 is used to backfill the loans to those institutions so they can continue to lend. Read more about the process here. The entire $25 goes to the lending institution and is paid back to you as the loanee pays back their loan. When your $25 is paid back you can withdraw it, or lend it again and again and again. My kids LOVE it. They really take their time considering the options, the payback schedule, the risk ratings, whether the person has kids their age... We look at the map to see where their potential choices live and talk about what they see in the pictures, how their lives might be different from or the same as ours. It's opened their eyes to the world a little bit more, and that's a good thing. There are so many ways to give back to the community and to the world, I'm going to start highlighting a couple every Friday Four for the next month or so. All of them will be organizations that either I or people close to me have had personal, direct dealings with, that we have contributed to with either time or money or both because we believe in the work they do. I've been a Meals on Wheels delivery driver for Mid-city Concerns for three years now. Every other Monday I pick up a cooler and hot pack from a local church and stop by anywhere from 6 to 12 houses in my assigned area to hand them a hot meal, a drink of juice or milk, a roll and butter, and to chat for a minute or two. It only takes about an hour most days, and less than a gallon of gas, but it makes a real difference in people's lives in our community. When my kids aren't in school they come along and the "grandmas and grandpas" love to see them helping! To promote independent living of Spokane's senior citizens and home bound through outreach in: Nutrition, Advocacy, Education and Recreational services through the Meals On Wheels Program and the Mid-City Senior Center. Mid-City Concerns is the "Center" of these senior's lives. When their apartments are poorly heated and they haven't enough money for food, they come in to get warm and to socialize with their peers in a safe wholesome environment. They receive assistance from a caring staff, trained to help them with problem solving and to make appropriate referrals for other needed services. We continue our advocacy program to further promote this cause for independence. Most important, they are treated with respect and kindness---and encouraged to treat each other in the same way. When I was in college in Utah, I'd travel up to Smithfield to visit my grandpa a couple times a semester. The Meals on Wheels program there helped him stay in his own home and ensured he'd have a hot meal and - more importantly - human contact at least once a day. Now, my grandfather was relatively well off and he had nurses come in daily and a young couple that lived in the basement so he wasn't often alone. I appreciate the program for what it did for him and even more for what it does for those less fortunate than he was. Love The Great Gatsby? How about a t-shirt with the entire novel printed on it? Big fan of Thoreau? Take a look at this beautiful poster containing all of Walden! Want to declare your passion for all things Austen? This Pride and Prejudice tote is for you! You can even get temporary tattoos quoting Mary Shelley, Jack London, James Joyce... I love the brilliant person(s) who came up with this!